A long time ago in a galaxy very, very near…before George Lucas ever sold Lucasfilm, LTD for four billion dollars to make it “official”, Leia Organa was my Disney princess. I was never a girly-girl and though I enjoyed fairy tales, Princess Leia was far more interesting than those gown-wearing, hair flaunting blondes. She was whip-smart, sharp-tongued, and could handle stormtroopers herself. She was also an important leader in the Resistance. Take that, Sleeping Beauty. In an era of not too many great female role models, Carrie Fisher gave girls a character to really admire. Of course she was beautiful too, but beauty was the least of her impressive qualities (even if the boys couldn’t see that sometimes). And I love that Carrie Fisher still doesn’t take any guff from anybody (if you’ve seen her Twitter @carrieffisher, you know what I mean). 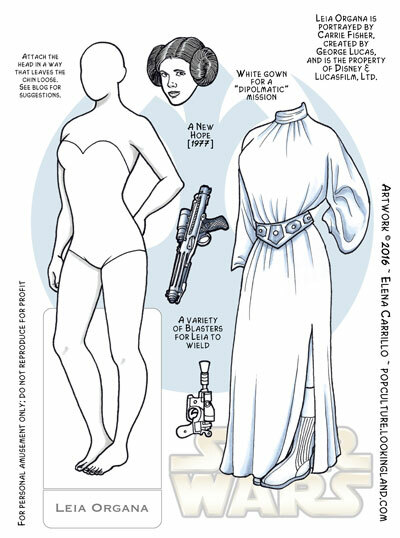 This is the first of 6 plates I have for Leia (she’s got quite a few costumes, like Luke). I was never a big fan of her original “bun” hair style (had trouble drawing it too), but it is her iconic first-appearance look, so I had to include it, of course. Because Leia has a lot of different hairstyles throughout the Original Trilogy, she has lots of swappable heads. Like Han, she doesn’t have many accessories, though, so I gave her some weapons (which is she does use in the series). Not much difference between the colored plate and the black & white plate on this one (even moreso on the next one). Leia does wear a lot of white! Just as with Luke and Han, I will likely update Leia for The Force Awakens, so there may be an additional plate eventually. I was honestly surprised and delighted to see her in the new movie (I had no idea), though I think she’s gone from the strongest woman in the galaxy to the most tragic. She’s still strong, though. And I fully expect that strength to carry her through this Sequel Trilogy. And I have my fingers crossed that she ultimately has something like a happy ending. She deserves it. Leia Organa, Original Trilogy. Bookmark.